The sundial that was, and is, in Ingleside Terrace. Note the shallow reflecting pool underneath the original sundial. As modern humans, we usually think time is about minutes and seconds and not being late for a meeting. But really, time is all about the position of the sun relative to the Earth. I love sundials because they’re a reminder that the entity we try to manage, control, spend less of, and schedule our lives by is actually tied to something in nature. You can be the time-telling shadowcaster in a sundial. Over the course of the day, shadows shorten and lengthen as the angle of the light changes. The length and angle of a shadow depends on where the sun is. 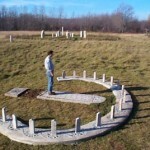 A sundial tells us what time it is by capturing the regular path the sun follows across the sky each day. Not only can the sun tell us what time it is, it can tell us what direction we’re facing. How? Put a stick in the ground and mark the end of its shadow. Wait 15 minutes or so, and mark the shadow’s end again. Draw a straight line between the two marks. The left end of the line is west, the right end is east. Face the line and you’ll be facing north. Good to know if you’re an adventurous trekker whose GPS batteries run out. Why does this work? Because the time of day and the position of the earth relative to the sun are actually the same thing. Perhaps our attraction for sundials is more aesthetic then scientific, though. The sundial above was created in 1913 in an effort to lure home buyers to a posh then-new development in the foggy Ingleside neighborhood of San Francisco. The New York Times picked up a short ditty on the sundial this weekend from Bay Citizen, a local news org partnered with the Times. 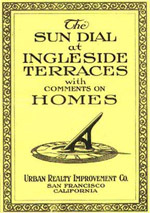 The 1913 brochure enticing home buyers to settle in Ingleside to be near the giant sundial. Or better yet, check out the original brochure for the neighborhood attraction on the website of the Western Neighborhoods Project–the original Outsidelands, before that silly rock festival co-opted the name. Read Yelp Raves for D-Street! in the SF Bay Guardian! Join the D-Street mailing list! Get special deals and fun facts! "We went on the "Invented in San Francisco" street tour, and LOVED IT! Robin is delightful, and makes the tour a total blast." "The group looks up at the mess of rock in a new way. Some may have walked by it a hundred times, never stopping to consider what it means." The creator of Discovery Street is profiled in the San Francisco Examiner's My City column. Check out the profile, with a list of nine off-the-beaten-path city faves, some of them featured on D-Street tours! Check out the profile of Discovery Street on Nature Blogs! Blogger Shannon Weiman, writing for the journal Nature, says "Bring your brain, your senses, and a healthy dose of curiosity, and join in on explorations of the science all around you. I am sure to become a repeat offender." Read the whole blog post. Are you a member of KQED? Discovery Street Tours are a member discount perk! Visit the KQED membership page to find out how to get your member discount on tours.